The N. Murray Edwards School of Business at the University of Saskatchewan (U of S) has earned accreditation by the Association to Advance Collegiate Schools of Business (AACSB) International. Founded in 1916, AACSB International is the longest-serving global accrediting body for business schools. Synonymous with the highest standards of quality, AACSB Accreditation inspires new ways of thinking within business education globally and, as a result, places Edwards among the top five per cent of business schools worldwide. Today, 810 institutions across 53 countries and territories maintain AACSB Accreditation in business. 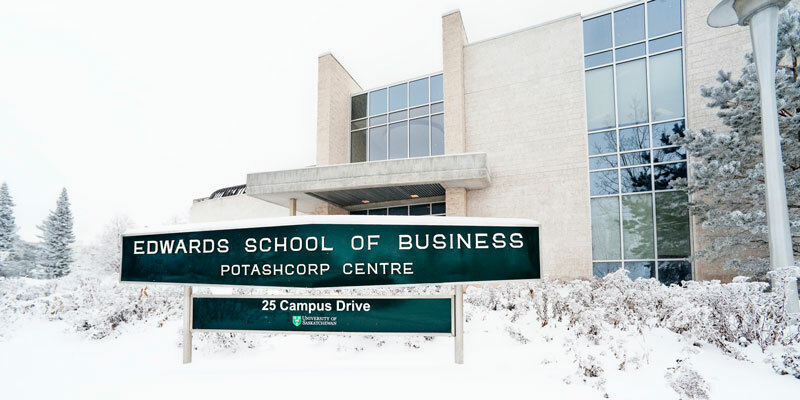 From humble beginnings as the first accounting school in Canada, the Edwards School of Business continuously strives to offer high-caliber business education that alumni and employers value around the world. Edwards boasts 1,700 students in its undergraduate program, approximately 215 students in graduate programs, and provides training and development to over 2,500 business professionals each year through Executive Education. Most recently, undergraduate students won School of the Year and Academic titles at the 2018 JDC West competition, and the school’s Enactus team was recognized with the 2017 HSBC Indigenous Advancement Project Partnership Best Project award. AACSB Accreditation provides a framework of 15 international standards against which business schools assess the quality of their educational services. Once a school earns AACSB Accreditation, it enters a five-year continuous improvement review cycle, ensuring that they have the resources, credentials and commitment needed to provide students with a first-rate, future-focused business education. As the world’s largest business education alliance, AACSB International—The Association to Advance Collegiate Schools of Business (AACSB) connects educators, students, and business to achieve a common goal: to create the next generation of great leaders. Synonymous with the highest standards of excellence since 1916, AACSB provides quality assurance, business education intelligence, and professional development services to nearly 1,600 member organizations and more than 800 accredited business schools worldwide. With its global headquarters in Tampa, Florida, USA; Europe, Middle East, and Africa headquarters in Amsterdam, the Netherlands; and Asia Pacific headquarters in Singapore, AACSB’s mission is to foster engagement, accelerate innovation, and amplify impact in business education. For more information, visit www.aacsb.edu.